One of the funniest, weirdest running jokes on NBC’s late, lamented Parks And Recreation is that the cheerful-looking Pawnee city hall building in which most of the characters worked was filled with very matter-of-fact murals depicting the Indiana community’s violent, racist, and just generally shameful history. Coincidentally enough, Alejandro González Iñárritu’s 2015 film, The Revenant, is also about America’s troubling, blood-soaked past, and it also makes frequent mention of the Pawnee tribe for whom Pawnee, Indiana was named. Demi Adejuyigbe, a digital producer on Comedy Central’s @Midnight and co-host of the Gilmore Guys podcast, has crafted an alternate title sequence for the film using the sprightly theme music and editing style of the Amy Poehler sitcom. The results are disconcerting, to say the least. It’s always nice to hear Gaby Moreno and Vincent Jones’ sprightly Parks theme song again, even if it’s accompanying footage of vengeance, betrayal, and stomach-churning bear attacks. Adejuyigbe actually grants full cast member status to its ursine thespian, listing “A Bear” among the credited actors, such as Leonardo DiCaprio. 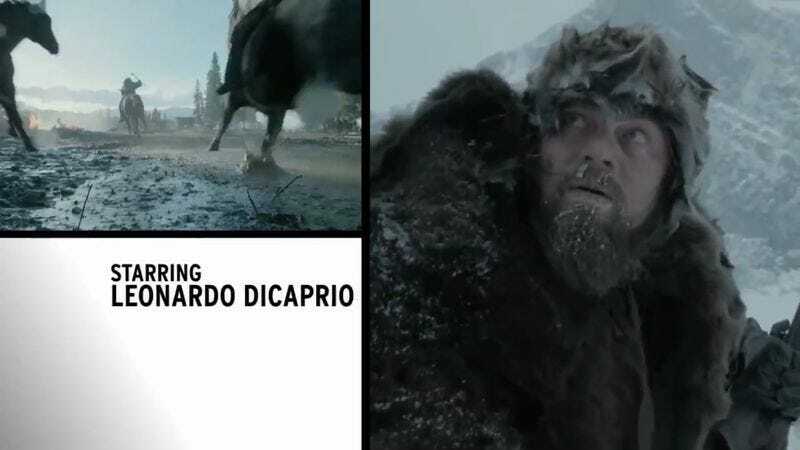 The distance between The Revenant and Parks And Recreation remains vast, however. While the beloved NBC comedy did occasionally deal with some darker themes, its overall production design remained essentially bright and cheerful. Nowhere was this more evident than the opening credits, which emphasized the natural beauty of Indiana and made viewers understand why the show’s protagonist, Leslie Knope, worked so diligently to preserve it. The Iñárritu film, on the other hand, is so dark and murky that it’s almost monochromatic. The Revenant barely needs to be in color. The terrain may possess an eerie beauty of its own, but nature here is largely threatening and dismal. And the poor, mud-stained actors in The Revenant all look uniformly miserable in a way not even government bureaucrats could possibly understand.